We have a core group made up of committed members, and a number of sub-groups formed around it. 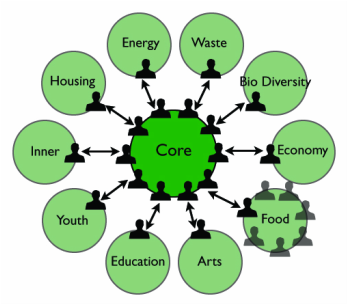 We connect with like-minded individuals and organisations within the PL:21 area to collaborate on projects beneficial to the community, and our goals of addressing climate change, reducing fossil-fuel dependency, and increasing local economic robustness. Our key areas of interest are: Food; Energy; Transport; Community; Ecology and Economy. We seek to be solution-focused, to work towards creating the world we want to live in, and to enjoy ourselves and make great connections along the way. PL:21 collects some personal contact details to keep people informed of our events, meetings and other activities. These are never passed on or sold to third parties. To find out more about what we do with the personal information we hold please view our Privacy Notice below.